When industries form a symbiotic collaboration, that's always a good thing. Especially when it's environmentally friendly and helps protect athletes from debilitating injuries. Russell Athletic is developing new football shoulder pads, made from recycled carbon fiber used in Boeing's 787 Dreamliners. "Boeing decided to build the 787 Dreamliner with carbon composites to increase fuel efficiency for our customers and improve the passenger experience. Our collaboration with Russell Athletic ‎is a fabulous opportunity to utilize the strength and lightweight characteristics of 787 carbon fibre to support elite athletes on the field." Russell Athletic says its patent-pending CarbonTek is thinner, stronger, and 10 percent lighter than its competitors. They say it also increases a player's range of motion, and forms a better fit to the shape of their body. 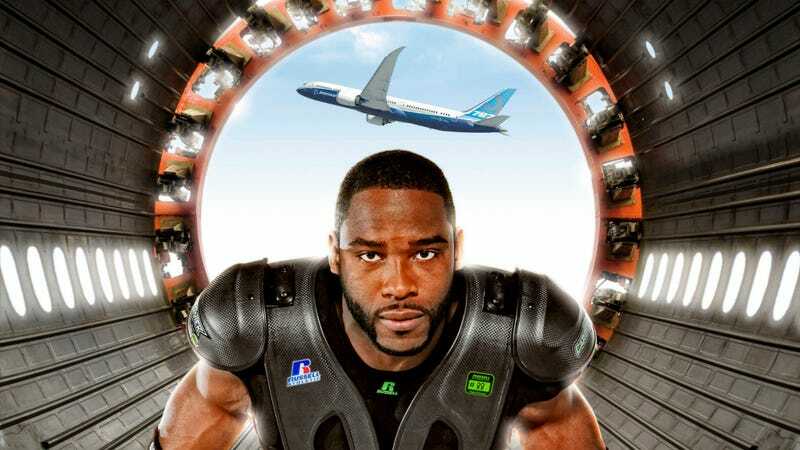 The use of Boeing's extra carbon fiber will help the company reduce its environmental impact, while the shoulder pads will reduce the amount of impact on a football player's body. The CarbonTek pads are already being used by several elite Division 1 NCAA football players, as well as NFL players Pierre Garcon, Mark Ingram and Colt McCoy.